100% Authentic Genuine Imported Leather Vest. At Herts Leather the leather which we use is of the top notch for all of our products. We have great expertise in leather products since 1990. The Coats/ Jackets /Vests are engineered to provide you with a comfortable experience like never before and to re discover yourself. Our technical staff works really hard to make the usefulness of our products to the maximum extent. Size is not an issue. We have a vast selection of sizes which range from XS to 5XL. We claim to be one of the best at what we do. We offer a unique service which is not be found these days, we do not stock our products we manufacture them the same day as soon as you order with us. This criteria is set in order to make the most out of leather, unlike others who stock them for different time periods and the jacket/ vest / coats donât look fresh and aging lines are visible in the products. The useful product range. All of our products do not only look good but are also really useful which give you the best experiences while wearing them. Each jacket/ coat/ vest has different types of zip or button fastening which keeps you away from the cold. The inner and outer pockets give you the freedom to carry some items on the go. High Quality inner linings are developed to provide you with a comfortable feeling from the inside. Simple Returns Policy. We assure that once the customer buys from us he wonât have to return the product but in rare case of a return we have a clear return policy of 30 days. Just message us with your concern and we would be happy to cater all the returns or exchanges. 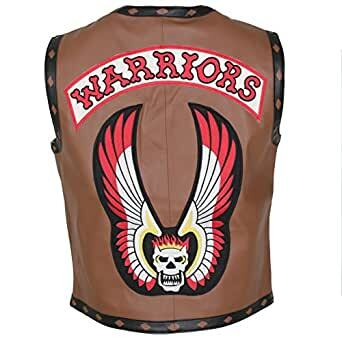 100% Authentic Genuine Imported Leather Vest. At Herts Leather the leather which we use is of the top notch for all of our products. We have great expertise in leather products since 1990. The Coats/ Jackets /Vests are engineered to provide you with a comfortable experience like never before and to re discover yourself. Our technical staff works really hard to make the usefulness of our products to the maximum extent. Size is not an issue. We have a vast selection of sizes which range from XS to 5XL. We claim to be one of the best at what we do. We offer a unique service which is not be found these days, we do not stock our products we manufacture them the same day as soon as you order with us. This criteria is set in order to make the most out of leather, unlike others who stock them for different time periods and the jacket/ vest / coats donât look fresh and aging lines are visible in the products. The useful product range. All of our products do not only look good but are also really useful which give you the best experiences while wearing them. Each jacket/ coat/ vest has different types of zip or button fastening which keeps you away from the cold. The inner and outer pockets give you the freedom to carry some items on the go. High Quality inner linings are developed to provide you with a comfortable feeling from the inside. Simple Returns Policy. We assure that once the customer buys from us he wonât have to return the product but in rare case of a return we have a clear return policy of 30 days. Just message us with your concern and we would be happy to cater all the returns or exchanges.